Here's a Sunday afternoon brain challenge. I've always had skin problems. Even when I was a child, I would get a rash on my arms when I went out in the sun. On and off through the years, I've had persistent problems of dermatitis, and very dry skin. Yesterday, I had a blood test. This was after about an hour of having micropore (a very gentle dressing for sensitive skin) on my arm. I can't use stronger dressings like band-aids. 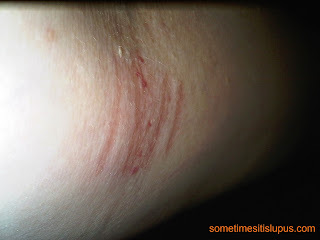 Now, about 30 hours after taking the dressing off, my arm looks like this. 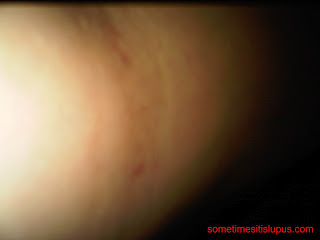 It's a little hard to see (because I have trouble taking a photo of my own arm) but it's now developed a bit of bruising. So, how do I look after sensitive skin? I use a lot of sorbolene - a glycerine-based cream. I use it as a moisturiser, instead of soap, and as a cleanser/make-up remover. 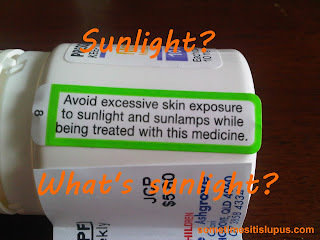 The only other skin care product I need is a maximum-protection sunscreen and a lip balm with sunscreen. I protect my hands with gloves when I do virtually anything; cleaning, washing dishes, etc. And I use a sensitive skin washing powder. For a couple of years, my dermatitis was so bad I could not even use that, and had to wash in pure soap powder only. My daughter's just got her learner's permit. We worked on stopping and starting, getting in and out of shopping centre parking spots (a good way to get the feel of how wide the car is and where it is on the road - something that was really bothering her), driving straight, how to do a 90 degree turn, and how to do a U-turn. 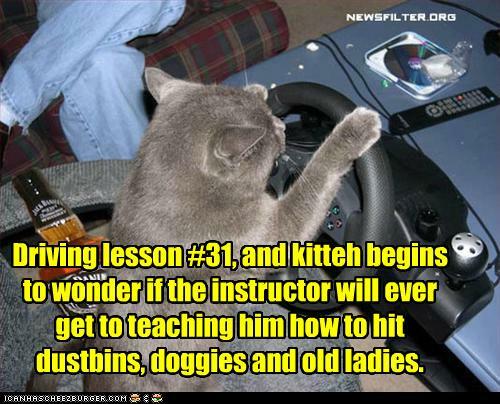 Maybe next lesson, we'll look at the accelerator, and get up past 5km/h. As anxious as she was, we didn't have any mishaps, so I guess my brain was functioning fairly well today. The concentration required has left me exhausted. That first driving lesson is a normal thing for a mum to do with her kids. For me that's a nice change, to just be Mum for a while, not worrying about doctors and medicines and tests. 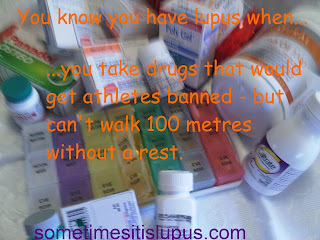 So much of my life is taken over by lupus, that it feels strange to me to do a totally non-lupus-related activity. But it is strange in a good way. Which is good, because we've got to clock up 100 hours of supervised driving over the coming year - and number two child will eventually decide he wants to drive as well. I'm adding a new link to the links page. The Chronically Awesome Jules Shapiro, who not only has her own blog, but works hard to encourage other bloggers with chronic illnesses, organises this daily paper. 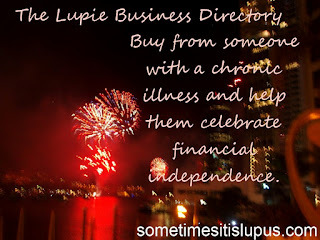 The BlogSupport Daily, picks up some of the best blog posts of the day, with regard to chronic illness and general health, and other areas of interest. Well, I've been back to my GP, and asked for a referral to a neurologist. I've also had a blood test to check for hormone levels. 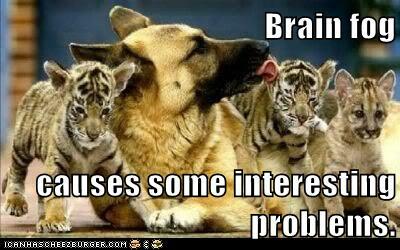 Another possible cause for brain fog (apart from lupus) is menopause. I'm getting up towards the right age for that, and because of my hysterectomy, it's hard to know if that is happening as well. If that is contributing to my brain fog, hormone replacement could help get control of it. As for my question of whether it's time to stop work again, the GP says to stick with work if I can - because it's good for me. So I'll take that input on board when I speak with the church council chairperson later today. Well, I thought the brain fog was clearing. I had started to think the flare was almost over and I was fine. Then I discovered I hadn't taken my pills this morning, and this afternoon, I'm exhausted, even though I had a nap for several hours. 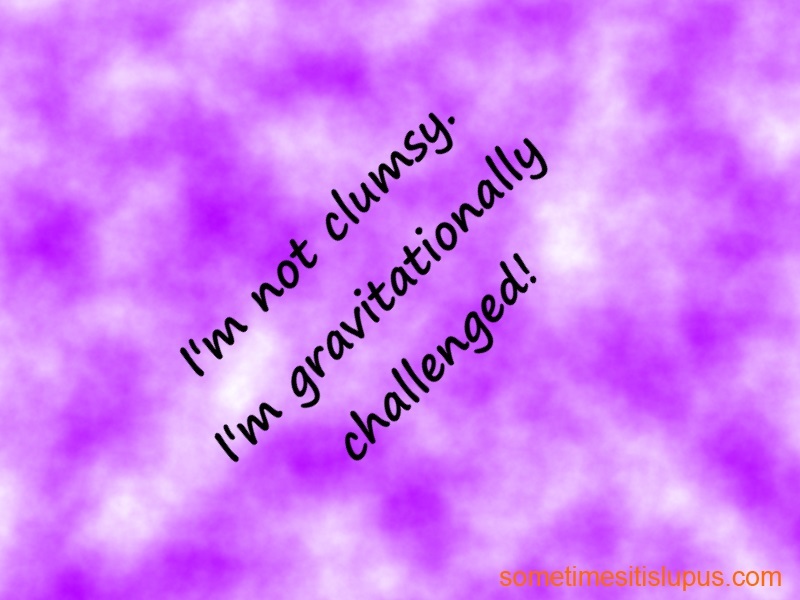 It seems my flare wasn't over - I was just having a brief reprieve. I'm glad of it though, because I got my washing done, and the kitchen floor cleaned. That's more than I've done for a very long time. I'm off to the doctor tomorrow morning - and a friend is going to ring me to make sure I get out of bed, and to remind me to go. I want to talk to her about the brain fog again, and ask about seeing a neurologist. There was something else I was going to ask her about as well, but I can't remember what it was - my friend knows though, I think, and will tell me about it tomorrow morning. High fibre foods and mono-unsaturated fats lower LDL. Well, it's weight loss group tonight, and we have a question that came up at last week's meeting: Does eating rolled oats actually lower your cholesterol? The longer answer is as follows. Cholesterol is a kind of fat that your body needs. It's present in all the cells of your body. It helps make hormones, and control metabolism. But like the salt we talked about last week, we need far less than most Australians actually have. 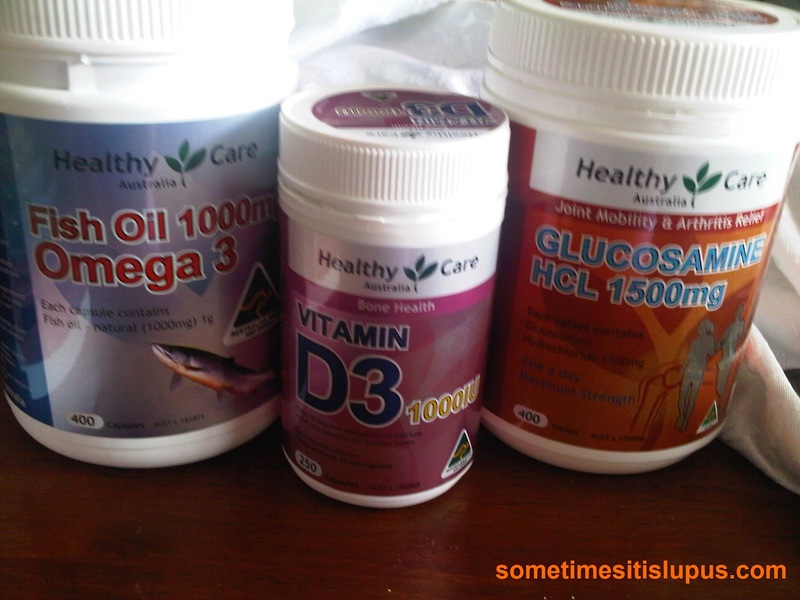 According to the Heart Foundation, 51% of us suffer from high blood cholesterol. When we are concerned about high cholesterol, we usually concerned about high levels of LDL (Low Density Lippoprotien) which carries cholesterol to the cells and can block arteries. The other kind of cholesterol, known to be the "good" kind is HDL (High Density Lippoprotien) which takes cholesterol out of the body. To lower LDL, we need to eat a healthy diet. There are foods that can help lower LDL, and one of them is yes, rolled oats. It helps because it contains soluble fibre - and all foods with soluble fibre help to lower cholesterol. 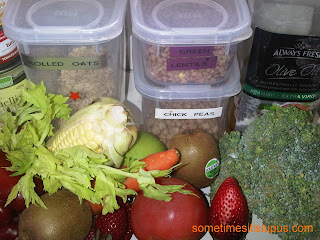 So that's rolled oats, barley, legumes, fresh fruit and vegetables. The fibre that helps us feel full and keeps the digestive system functioning well, also helps lower cholesterol. Eating monounsaturated fats, such as the omega three fats in fish, olive oil and the fats in nuts and avocados also helps to lower LDL. The "bad fats" the saturated fats in animal products will increase LDL. So another way to reduce cholesterol is to take the skin off chicken, remove the visible fat from meats, and where possible avoid the hidden fats in things like cakes, biscuits, and fried foods. And, of course, we need to opt for low fat varieties of dairy products. Exercise also helps reduce LDL, so adding exercise into the daily routine can help. Thanks to FlashGameHQ, here's something for a fatigued day, or a foggy day when you're trying to get your head together. I'll try adding a puzzle game to the site every now and then to get you thinking - let me know if you think it's a good idea. I'm starting to feel like this flare might be easing. My brain fog's settled a bit, in that I haven't done anything (or at least been caught doing anything) completely irrational in the past day or so. This morning I was able to notice that someone apparently forgot that my plants needed water. My herbs were all wilted and my poor tomato plant was lying flat on the ground. 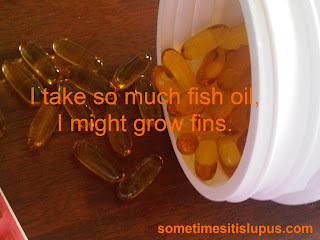 I gave them all a good soak and hope that is enough to get them started again. When I had my prayer time, I was actually able to make sense of the things I was reading in my Bible and my prayer book, and actually understand something that God seemed to be trying to say to me. I've looked at the housework which is way, way behind, and find that it's not quite as overwhelming as I thought, and I can start to plan how to do a bit at a time and eventually catch up, without overdoing things. It will take weeks, but my mind is functioning enough that I can actually start to set priorities which does take away a lot of the sense that it's all too much and just impossible. 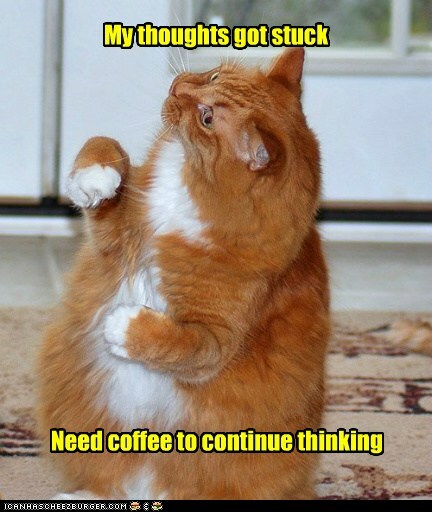 I can see what needs to be done, and which things are more urgent. And I'm able to think through such things as: it's possible to write this post, while using the TENS machine, so I'll be in less pain, so I can manage to do some washing. It is so good to start to feel I have my own brain back. I don't know how long it will last. But while I have it, I'm going to enjoy it. Thank you to everyone who has been giving me messages of support on the blog and on social media while things have really been bad. It really has made a huge difference. A new link has just been added to the lupus links page. 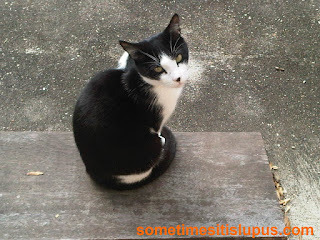 Please take a moment to check out Amy Has Lupus. 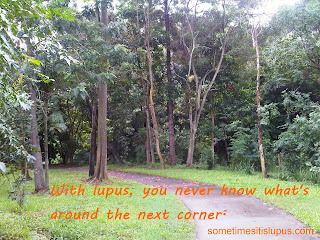 She's new to lupus and new to blogging, so please stop by and show her some love. Amy also has an on-line awareness project called The Faces of Lupus, which is worth a look. My ongoing battle with brain fog has been keeping me occupied lately. Yesterday, my son rang me asking for a lift home - he'd caught a bus as far as the next suburb - but a connecting bus to get him the rest of the way home would not come for more than an hour. Since it's only five minutes each way for me to get him from that bus stop - he usually calls to see if I'm free and save him from waiting. Well, yesterday afternoon, it wasn't quick or easy to get him. 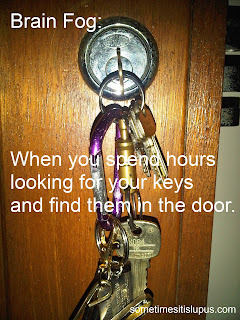 I searched for ten minutes for my keys, then texted my son to say I was still looking for them and if the bus should arrive before I got there to catch it. I practically tore the house apart. Then I took the spare car key to go and get him. Since I don't have a spare house key with the spare car key, I just pulled the front door shut behind me without locking it. I told this whole story to my son on the way home from the bus stop. When we arrived home and went to open the (unlocked of course) front door, we found the keys hanging in the lock. My 18 year old son's subtle and caring response to this situation was: "Mum, you're an idiot." One of the questions that comes up at Thursday night weight loss group quite often is the question of how much salt we actually need, and how much is too much? So what have I been able to find out? Firstly, we don't need salt, as such. We need a small amount of sodium, most of which we habitually eat as salt (sodium chloride). About 90% of our sodium intake is in the form of salt, so for our purposes, watching our salt intake, is a good way to keep our sodium from getting out of hand. The amount Australians eat, is far more than we actually need. Most of us are eating around 10 grams of salt a day. The upper safe limit (according to the National Health and Medical Research Council - NHMRC) is 2300 milligrams (2.3 grams) of sodium per day. That equates to about 6 grams or 1 1/2 teaspoons of salt. That is the maximum amount of sodium it is safe for an adult to eat (from all sources - not just what we add when cooking or at the table). Interestingly, this is the amount used for the % of Recommended Daily Intake used on boxes of cereal and other products. The amount the NHMRC recommends as a target amount for people to eat is, not surprisingly, a long way below that upper limit. It sets a target of 1600 milligrams (1.6 grams) per day for people who are older, overweight, have high blood pressure, or want to maintain a healthy blood pressure across the lifespan. I expect that people wanting to care for their blood pressure should include everyone. That 1.6 grams of sodium equates to 4 grams of salt (a teaspoon full). 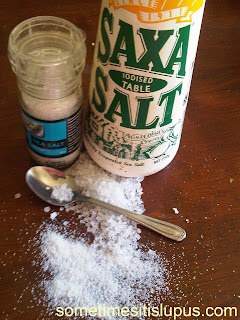 So, all up, our salt from all sources should be no more than a teaspoonful in a day, or 1600mg of sodium, and having a little less than that will not hurt us. Given that the average Australian eats more than twice that amount, we need to look at how to reduce our sodium intake. 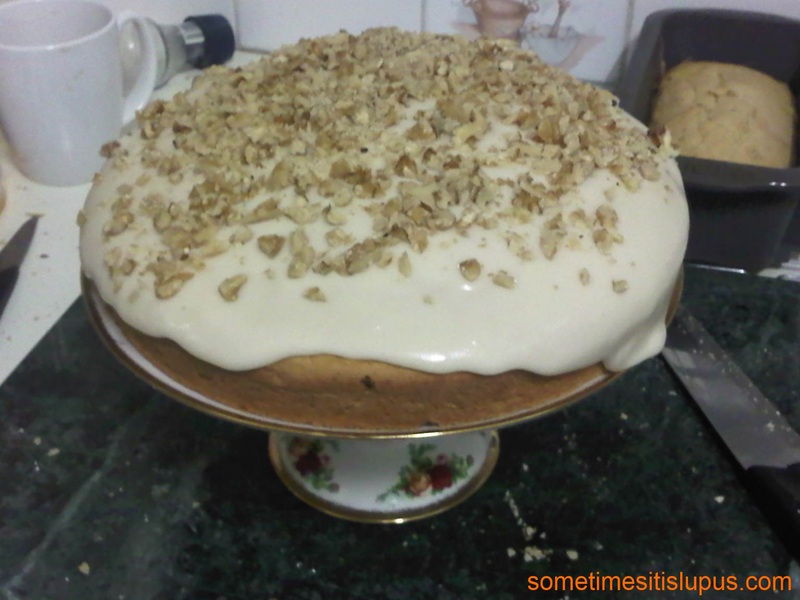 Cook at home, instead of going out. Take-away food has lots of salt, and you only have to watch an episode of Master Chef to see how much chefs love salt. Cook without adding salt. Use fresh ingredients wherever possible - virtually all packaged food products have some form of salt added. Fresh fruits and vegetables do contain sodium - but nowhere near as much as you will find in packaged foods. When you must buy packaged food, choose foods that have less than 120mg of sodium per 100g of food. Use herbs and spices to add flavour to food, rather than fats and salts. Remember the reason people like food that tastes of salt is just because of habit - habits can be changed. Steam, grill, stir-fry, or microwave food. Don't boil food in water, because flavour is lost (along with some nutrition), and it is tempting to replace the lost flavour with salt. 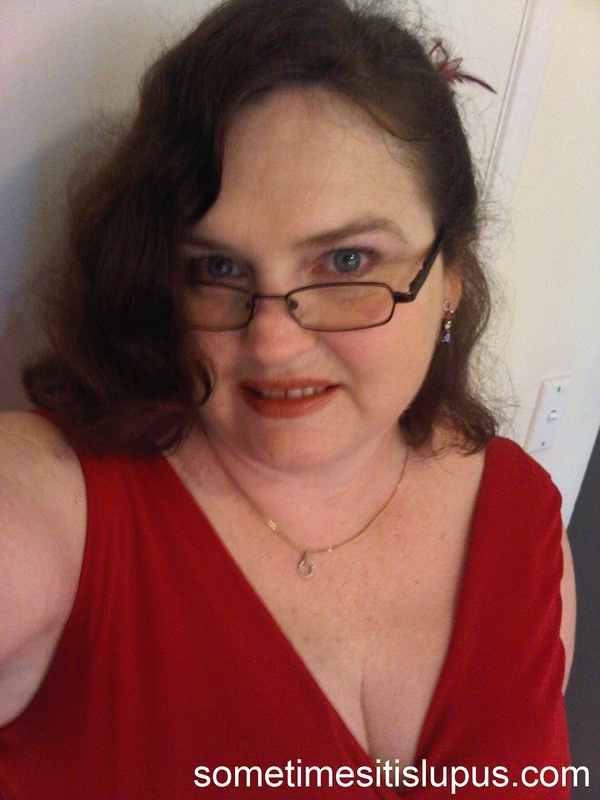 All dressed up for my night out. Sometimes, brain fog works out in my favour. A week or so ago, I had a phone call from Brookside Shopping Centre to tell me I'd won the competition I'd entered. I have no idea what competition I entered, but the prize was a great gift. I invited a friend who I've known for more than 20 years, and who I don't get to catch up with anywhere near as often as I'd like. Catching the train together gave us time to catch up, as well, which just added to what a fantastic night it was. 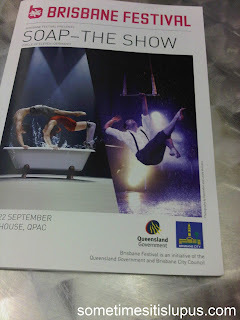 My friend and I got to see Soap - an amazing show that combined acrobatics with music dance and comedy. 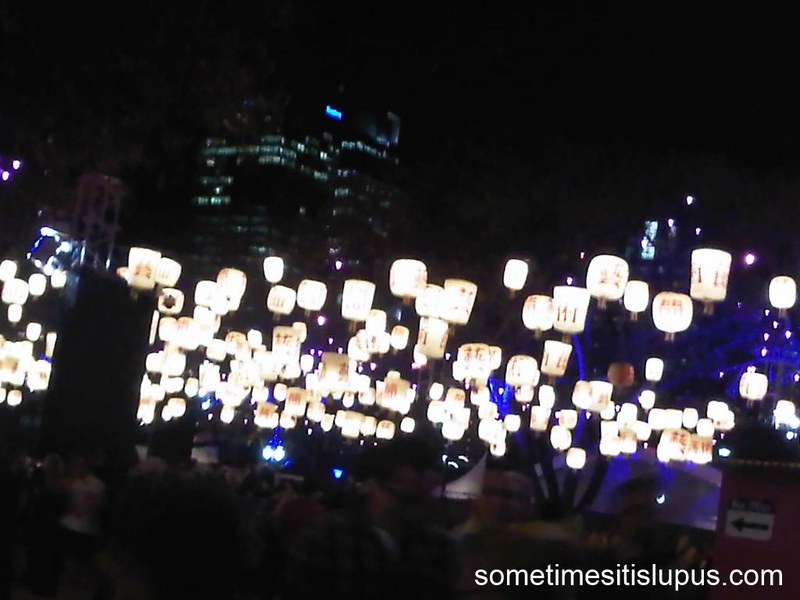 It was unlike anything I'd seen before, and just wonderful. I don't get to go out to the theatre very often, partly because of the cost, and partly because a late night does wear on me a bit. Just a chance to get dressed up and go out was a special treat for me. Today, I'm exhausted, and will probably need to sleep a lot, but it was well worth it. 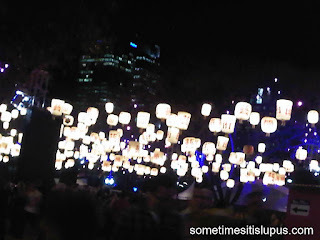 Chinese lanterns at Southbank for Brisbane Festival. The latest addition to the business directory is Mary Kay Independent Consultant Laura Brewer. Why not take a quick look at her link? You can shop in person with her (depending where in the world you are), or shop on line. 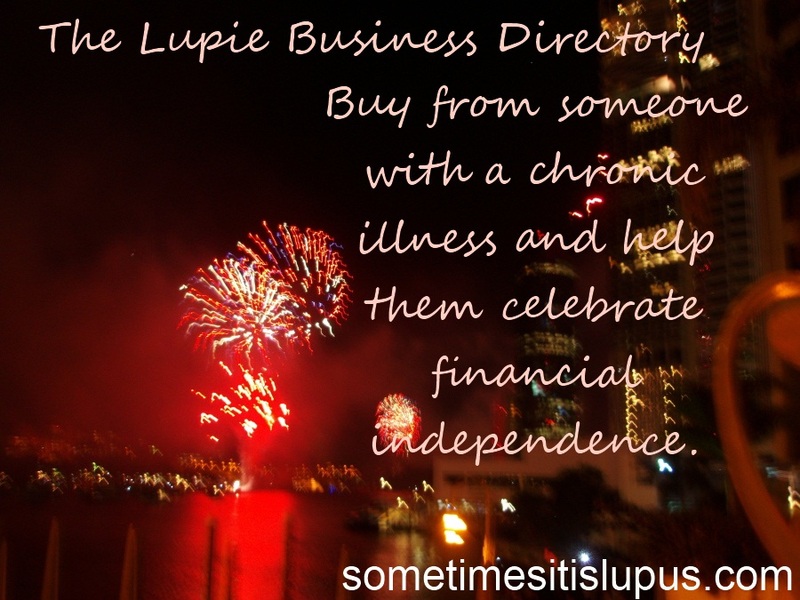 If you know of any other businesses owned/run by someone with a chronic illness, please email me at iris@sometimesitislupus.com and let me know about it. My 21-year-old daughter and her fiancée are looking for houses to rent. My other child is 18 now, and in the next couple of years, he will also start looking at going out on his own. Again, it will be good for him to do so. But that leaves me wondering: what I will do when they are both gone? Clearly, I won't need a three bedroom house to myself. I'll have the opportunity of downsizing to something smaller, and easier to manage. That's a plus. There's also a minus. The worst part of this latest flare is brain fog. So far the bizarre things I've done have been frustrating, or even humourous. Apart from the stuff I've posted about before, I've found the cat in my wardrobe, and the other day realised that I didn't have my mobile phone in my handbag, but did have the pets' flea treatment there. At the moment, people are coming and going all the time at my home. There's always someone who would notice if I was doing something very strange. Once the kids leave, it's just me. No-one will know if I do something weird, or dangerous. Of course, I probably have a couple of years still to think about this. Which is good, because it might take me that long to get my brain working again. 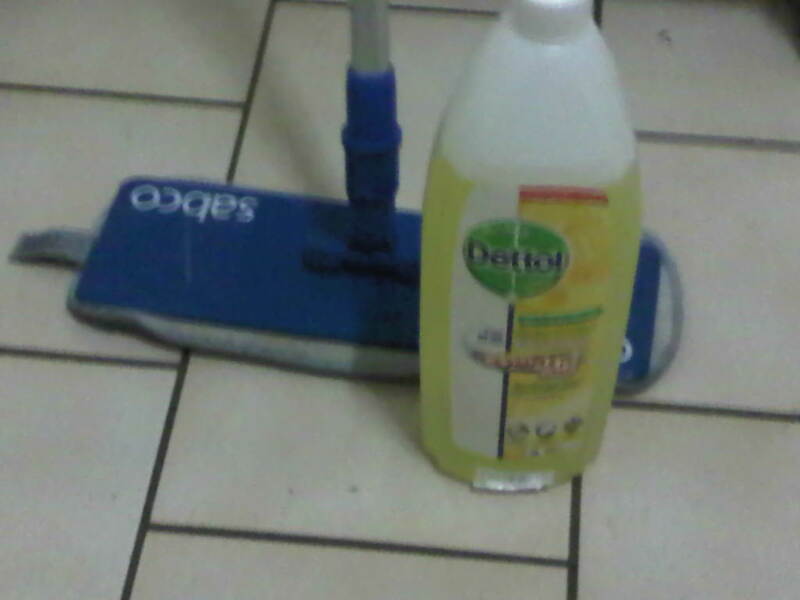 Spray and wipe floor cleaner. When I used to work in a hospital, I would at times watch the cleaners mopping the floor - they'd spray a cleaner on the floor and wipe it over with a wide mop and it was done. What was wonderful was that the floor could be cleaned without lugging around a bucket of water, and with only one wipe over. I've been looking out for years, to get that cleaning stuff for my home. Yesterday, I found it at the Reject Shop. (Only $2 a bottle.) Guess what? It's plain old spray and wipe, just in a bottle that tips upside down and sprays out of the lid. In case I can't get it again for a while, since the stock at the Reject Shop changes regularly, I'm keeping the bottle. I can refill it with a regular spray and wipe refill bottle when I need to. All it needs is to be sprayed on the floor, and wiped over with a slightly damp mop, or sponge. All done, and it dries very quickly. And I didn't have to carry a bucket of water! Thanks to brain fog - I forgot to mention, the mop I'm using is a microfibre one. The microfibre cloth sticks on with velcro, so I can just rip it off to rinse it out. No bucket required anywhere, and no bending either. 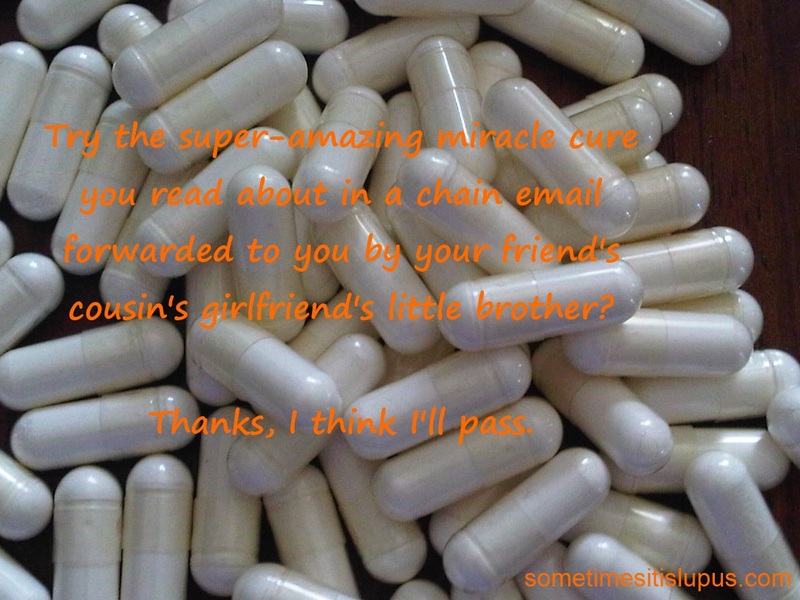 I had the wonderful experience of hosting Patients for a Moment Blog Carnival this month. It's the first time I've done it, and was delighted to hear from other patient bloggers, and read their work. 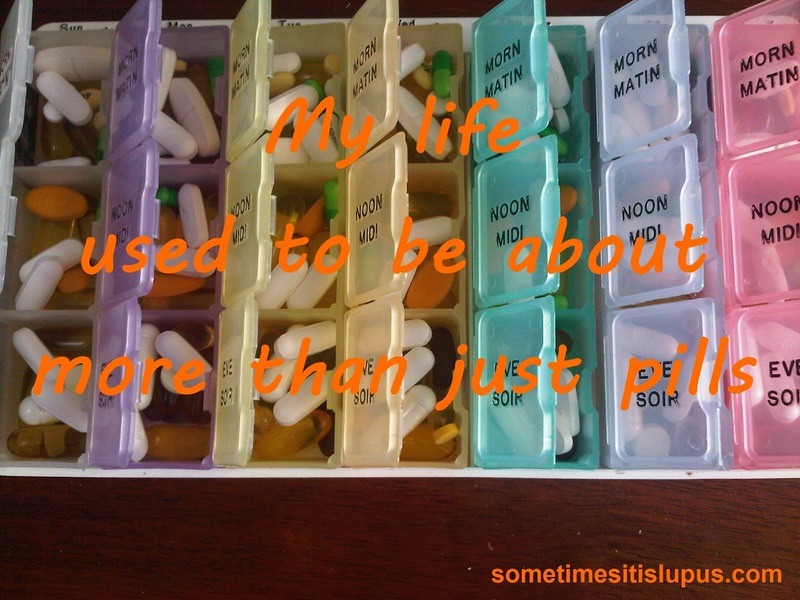 The topic I set was "You know you have ... when ...", based on one of my posts, complaining about life with lupus. There were four responses from bloggers, and they're all well worth reading! Let's have a brief look at them. If there's a "best in show", it has to go to RA Guy at Rheumatoid Arthritis Guy. He started a bit before the rest of us, and had some help. His post You Know You Have RA When... has more than 500 responses from readers, some funny, some sad, all out of their experience of rheumatoid arthritis. You know you have RA when you need scissors to open a packet of Doritos; you have to place the shampoo bottle against the shower wall and lean on it to get shampoo out of the bottle, etc, etc. Next we take a look at what it's like to live with migraine, with Diana Lee at Somebody Heal Me. 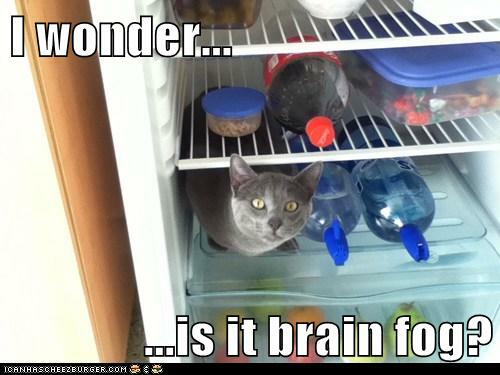 Did you think a migraine was just a bad headache? Think again. Diana's post You Know You Have Migraine When... explains just how bad it can be to experience migraine. You know you have migraine disease when people tell you how good you look despite the fact that your pain is 8/10, you're dizzy, hot, slow witted, and just about to puke on their shoes. Then let's visit Selena at Oh My Aches & Pains! Selena's post You know you have chronic illness when... gives 20 points, that I think just about everyone with a chronic illness will agree with. I know I nodded and smiled at every one of them. She make great points like: You and your chronically ill pals speak in code, using words like: fibro-friendly, painsomnia, Spoonie, ChronicBabe, CA (chronically awesome) and AWAP (as well as possible.) I have to admit that I sometimes forget that healthy people probably don't understand most of these terms. Thank you to all the awesome bloggers who took part! Patient bloggers beware! Turn on the lights. Lock the doors. Make sure you're not alone. Selena at Oh My Aches & Pains! has a Halloween topic for you. It will be "The Fright Files: Stories of Medical Mistakes." Watch Oh My Aches & Pains! or PFAM for the call for submissions in the first week of October. I live with an ongoing campaign of finding ways to do things that take less energy and cause me less pain. This afternoon I washed the car. Washing the car is a task which takes way too much bending and stretching for me, but sometimes it just has to be done. So here's some of the tricks I've discovered. Raise the bucket. I used an upside down plant pot (a large one.) This saves bending to ground level. Fill the bucket in place, using the hose. Do not try to carry a bucket full of water. Use the bucket for mixing water and car wash liquid. 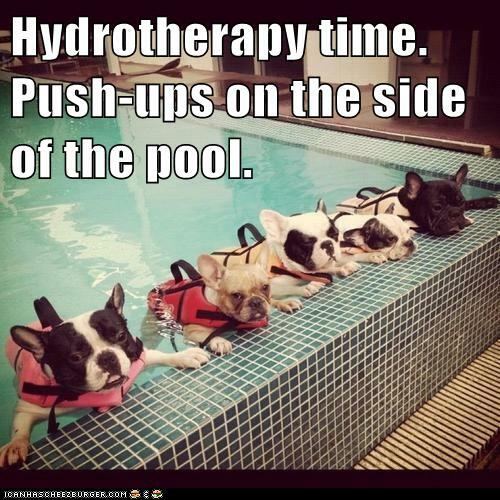 Use the hose. (That was banned here during the worst of our 10 year drought, but I think lupies have a legitimate reason for doing it now.) Rinse dust off the car with the hose, on fairly high pressure. Then swish your cloth or sponge, soaked in the bucket with car washing liquid, over the car lightly. 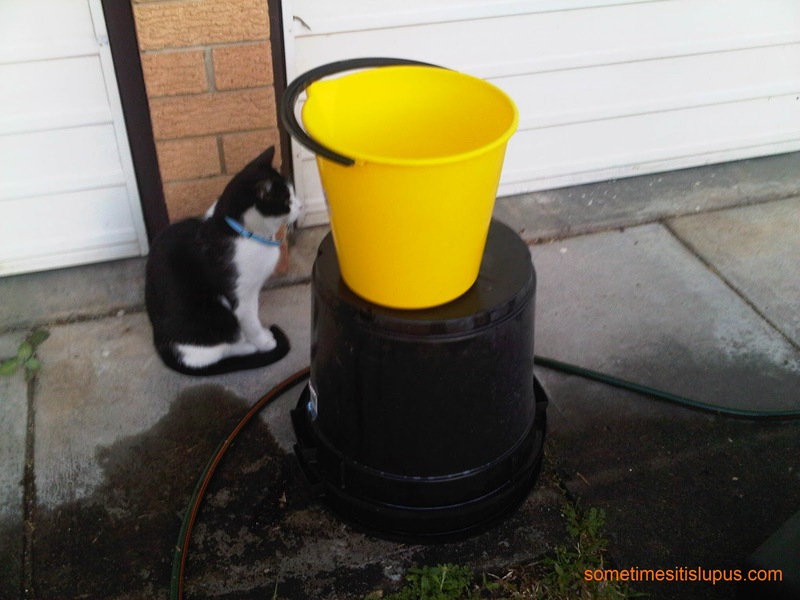 (Walk back and forwards to the bucket, rather than trying to move a full bucket around the car.) Only actually rub if there's spots to remove, otherwise work as lightly as possible so you're saving a bit of energy and your joints. Unless you're especially bothered by water marks, don't bother to dry the car. Leave cleaning the inside of the car for another day - don't try to do both at once. Of course, if you can afford it, the most energy-saving way to wash the car is to pay someone else to do it. We've had a reprieve for winter, but otherwise, here in the heat of Brisbane, our little kitchen is often bothered by tiny fruit flies. These little wretches defy all chemical means of killing them. It doesn't matter what brand of spray we buy, we can almost hear the little monsters laughing when we spray. A year ago, a cleaner we had (when my income was slightly higher and I could afford a cleaner) suggested fly papers. It was a good old-fashioned rememdy, and let's face it, being physically stuck to the paper meant the little pests could not get away. 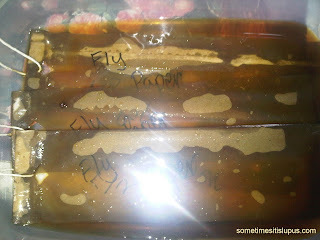 The fly papers worked. Thousands of tiny black bodies were stuck to bits of paper hanging from our ceiling, which was pretty unpleasant, but I could cook and do dishes in peace. 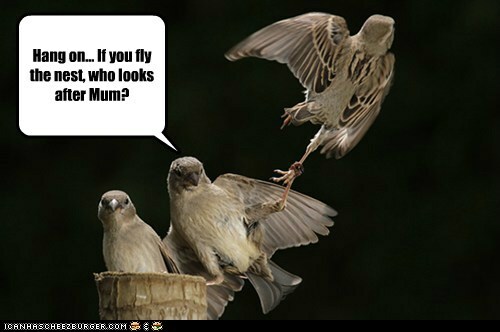 We've run into some problems just lately - supermarkets have very recently stopped stocking fly papers. It may be that they stopped for winter, and haven't caught on that it's spring again. At any rate, this made me stop and think: just how hard can it be to make fly papers? Basically, all they have to do is hang around, attracting flies, and being sticky. So I made my own. Cut paper bag into strips. Cut small holes at the ends and thread lengths of string through. Place syrup and water in the cup and microwave 30 seconds to make the syrup more liquid, and mix them together. Pour the warm syrup and water mix over the papers. Cover with plastic and leave to soak overnight. Place a cake cooling rack over the oven tray (to catch sticky drips), and spread the papers on the rack to dry for several hours. 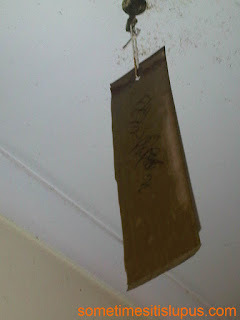 Hang your new fly papers somewhere they won't get caught in people's or pet's hair, etc. There are some things about lupus that make absolutely no sense whatsoever. One of the things that often gets to me is that when I'm incredibly sick, my blood tests will all look really good. The GP sent me for a blood test. The result? I should be perfectly healthy. 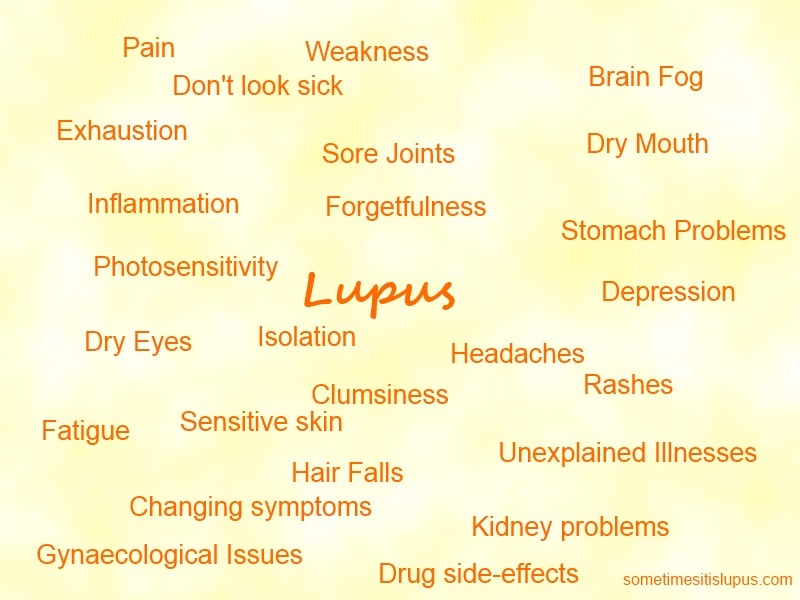 All of the indicators for lupus were within the "normal" range. 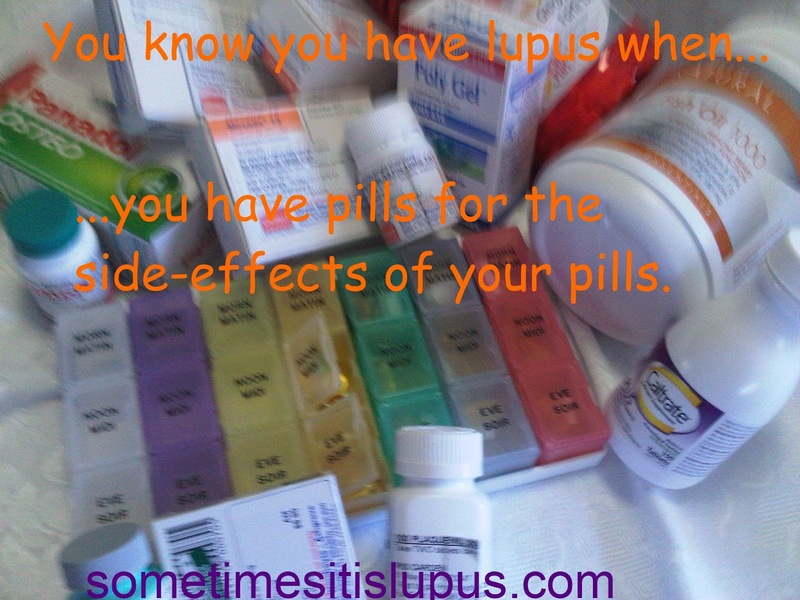 There was nothing in the blood work to indicate my lupus was active at all. I would have started to think I was crazy, except that other people with lupus tell me they experience the same thing. Sometimes there's a disconnect between what the evidence in the blood tests is showing, and what we're actually experiencing. (In fact, a proportion of people with lupus just don't ever have positive blood tests. 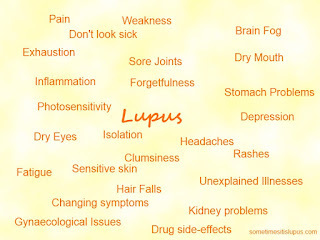 Lupus is so complicated that people can have any number of symptoms, and not have it show up tests at all.) We don't imagine it, there's just no test that accurately measures how active lupus is, because it does different things at different times. What could my GP do about my current flare? Well, not a lot. The rheumatologist has so finely balanced my cocktail of drugs, that she's not willing to interfere with it. So she's given me a Vitamin B12 injection (with another to follow next month) to help me deal with the fatigue. 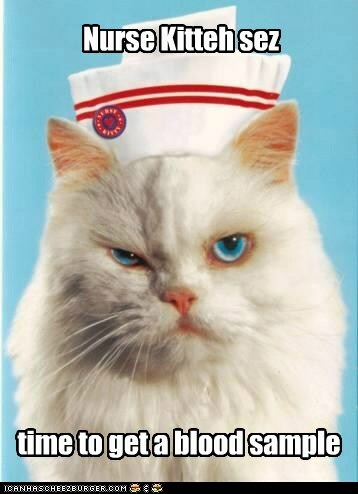 We both hope that if I can get over the worst of the fatigue, the other symptoms might start to improve as well. Apart from that I just get by as best I'm able, knowing that all flares eventually pass. I haven't posted about Weight Loss Group for a while, because we've been working our way through the National Dietary Guidelines. That's taken several weeks of just continuing on the same thing. If you've never read it, it's a good explanation of how to have a healthy, balanced diet. Tonight we're doing something new. We're looking at reading food labels. So here's two examples of breakfast cereals. (There's no point in comparing foods of different types - we're looking for different things in different types of foods. I'll actually take the boxes to the meeting to for people to look at tonight - but reading the information panel, is really all you need. Firstly, let's look at the ingredients. Cereal A: Corn (93%), Sugar, Salt, Glucose Syrup (From Corn). So mostly this cereal is just corn, with added sugar and salt for flavour. There's no artificial additives. 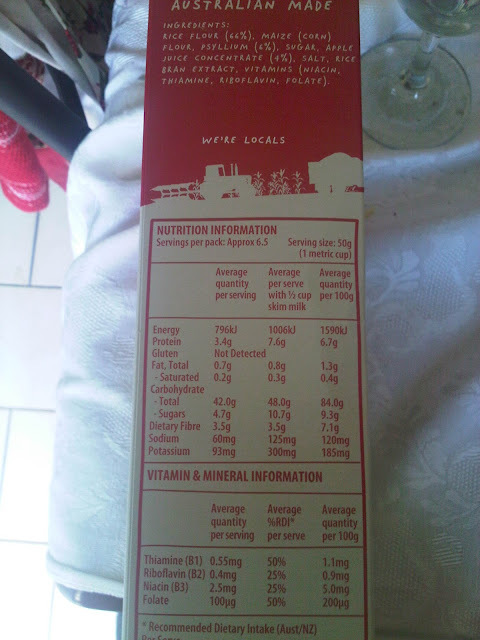 There's also no added vitamins or minerals, and no ingredients high in fibre. Cereal B: Rice Flour (66%), Maize (Corn) Flour, Psyllium (6%), Sugar, Apple Juice Concentrate (4%), Salt, Rice Bran Extract, Vitamins (Niacin, Thiamine, Fiboflavin, Folate). There's a lot more ingredients in this. It still has two kinds of sugar (fruit juices are another way to include sugar, without calling it "sugar"). It also has salt, although we'll see later that it is much less salt than the other cereal. It has psyllium and rice bran extract, which both provide natural fibre. It doesn't have artificial colours or flavours, but it does have added B group vitamins and folate (which is important to help the body absorb iron). It's interesting to note, that each pack has three columns on the nutrition information panel. Cereal A: has average quantity per serving, % of daily intake per serving, and average quantity per 100g. The first thing to do here is ignore the middle column. This is % of daily intake for someone on an 8700kj per day diet. If you check your recommended intake on Calorie King you'll find that is very much more than recommended for women, especially women trying to lose weight. Cereal B: has average quantity per serving, average per serve with 1/2 cup skim milk (the way you actually eat it) and average per 100g. Comparing the two: You will notice that a serve of Cereal A is 483kj and a serve of Cereal B is 796kj, which makes it appear that Cereal B has more energy than Cereal A. This is just an appearance. If you look closer, you notice that a serve of B is 50g, while a serve of A is only 30g. For a fair comparison, we need to look at the average per 100g column of both - this is the one that is the same. Serving sizes are set by the company making and marketing the product. They can be manipulated to make the product look better (ie by having a small serving size). This is a trick you'll see on a lot of products in the supermarket. 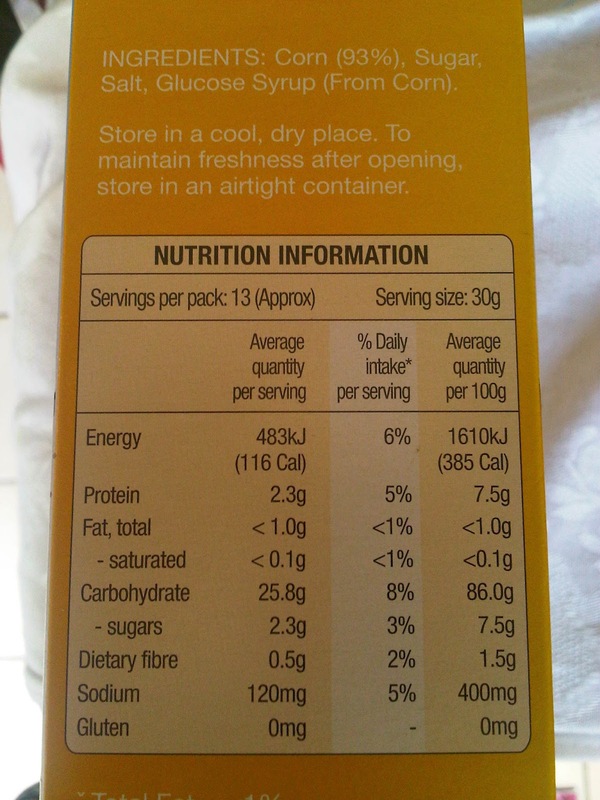 A number of packages that look like single serves will actually have two "serves" according to the nutrition information panel. Be aware of the risk that you may be tricked. For an accurate comparison of two foods of the same type, we need to line up the information in the 100g column side by side. What are we looking for when we look for healthy food? We want the lower energy because we're trying to lose weight - Cereal B wins here, but not by a lot. We want lower saturated fat - they're both quite low. We want low sugar (but only because sugar is energy dense and increases the energy in food.) Cereal A wins here. Remember, the glycaemic index is far more important than whether the carbohydrate is sugar or starch, but neither of these cereals are marked with their GI. We want high fibre. Fibre helps us feel full, and helps keep our bodies functioning effectively. Cereal B wins this by a long way. And we want low salt, because although we all need a small amount of salt, most people eat far more than is healthy. Cereal B wins this one as well. From comparing the two, I'd go with Cereal B for preference. We use the 100g (100ml for liquids) column of the nutrition information panel to compare products so we have a fair comparison. When it comes to our actual serving, and recording it on Calorie King, it's time to use the actual serving size set - or to set your own serving size, but measure it, and tell Calorie King how much you've actually eaten. You don't necessarily have to weigh and measure food every day, but doing it from time to time to ensure you still have a fairly good idea of what a serving size is, will make a huge difference to your weight loss. No matter how hard we work at checking that we are buying the very best food, if we are not actually paying attention to our portion sizes, we'll end up eating far more energy than our bodies can handle. Our weight loss group uses calorieking.com.au which is a free site, or the Calorie King books which can be purchased fairly cheaply from most newsagents as the base for our program. 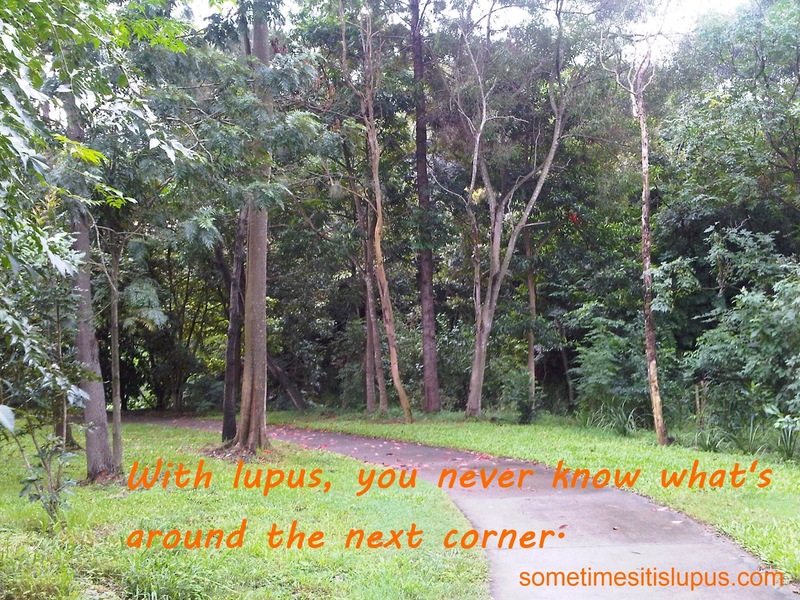 I'm very excited about what's been happening at the Sometimes, it is Lupus Facebook Page. I only started the page a month or two ago, and it's only got about 390 likes - but something very special has started to happen in the past week. People have started asking questions, looking for information from other lupies on the site. And people are sharing useful information that they've come across. It's becoming a source of support for people. For me, that's very exciting. 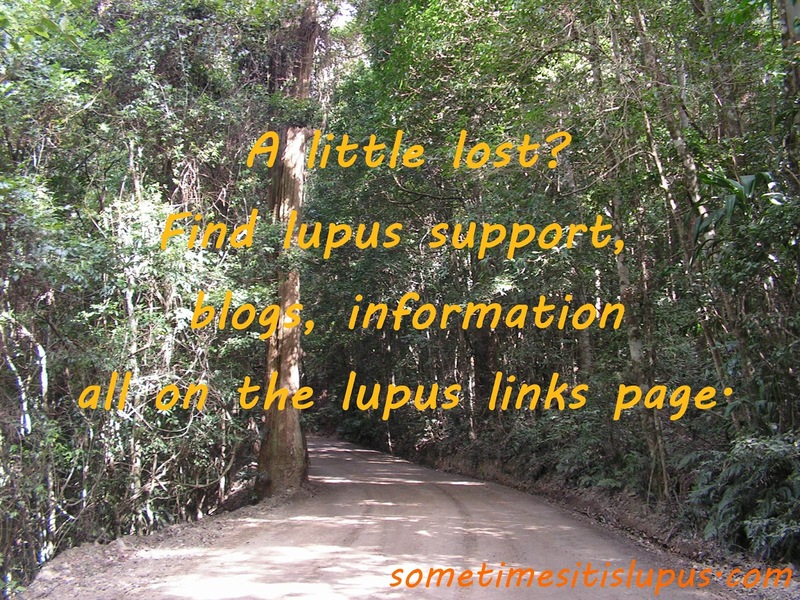 It's one of the reasons I started this blog - was to help find support for people with lupus. So many of us spend a lot of time on the internet, simply because it's hard to get out of the house. Finding people who understand and are as close as the computer is a wonderful thing. Thank you to everyone who has "liked" the Facebook page, and everyone who takes part in conversations, making it better for everyone. You can follow Suicide Prevention Australia on Facebook here: https://www.facebook.com/SuicidePreventionAustralia. People with chronic illnesses do suffer from a higher rate of depression than the regular community. If you are not coping, get help. If someone you know appears to be struggling, ask if they're OK, and help them to find help if they're not. If you need support, you can see your GP, a counsellor, psychologist, psychiatrist, a member of clergy or call Lifeline (in Australia) ph 131114, before problems start to feel too big to face alone. One of my biggest struggles when I first became ill with lupus was learning to say "no". I was always anxious to do anything I could to help out anyone I could, any time I could. I would put off things I had planned to do for myself when the opportunity arose to give someone else a hand. Having to learn to budget my energy, meant I had to learn that I couldn't do everything. Sometimes, I had to say "no", when I was asked to do something. It felt bad. I felt guilty, like I was a failure. It felt selfish, to put my own needs ahead of other people's. I could hear echoes of my mother's voice from childhood (fortunately she's not talking to me now), telling me how useless and worthless I was, how lazy and uncaring. But I learned to say "no" because there just wasn't enough energy left for me to say "yes". It was a necessity, a survival mechanism that I just hadn't had before. Strangely, only one person ever complained about it. Everyone else accepted that it was what I had to do. 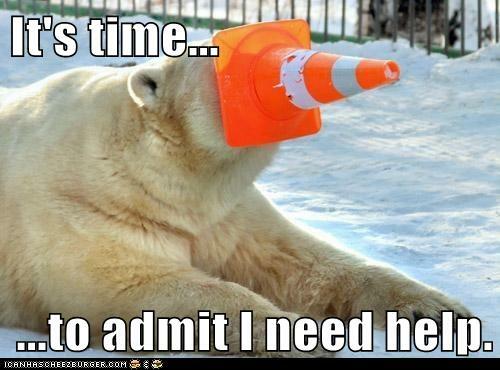 There's one instance where I've never had any trouble saying "no" - when people have offered to help me. I have always been independent. From a very early age, I learned to be responsible, and that if I needed anything done I had to do it myself. To admit there was anything I couldn't do or achieve for myself was just unthinkable. The effect of my complete independence has been a growing pile of things that need to be done - but just have to wait until I have a better day, constant stress about how I'm going to pay the bills now that my income is so much reduced, and a feeling of severe guilt whenever I use any amount of precious energy or money on a treat for myself. Today, something just "clicked" for me. All the time I used to be willing to do anything I possibly could for anyone - I genuinely did want to be there to help. So perhaps, all the people who keep offering to help me - genuinely do care and do want to help. My daughter asked me if I wanted her to do my washing today. I said "yes". Do you want to guess what happened? Let's start with what didn't happen. I wasn't struck by lightning. My mother didn't jump out of a cupboard pointing an accusing finger and telling me how useless I was (if you're laughing at that - you don't know my mother). The sky didn't fall in. I wasn't so overcome with guilt and a sense of failure that I crawled under the carpet. My daughter didn't resent the extra work. What did happen was, my daughter washed my clothes and hung them on the line, and now I don't have a mountain of dirty clothes in my room. What I felt was relief and gratitude. So, having tried, and found out it worked out OK, I'm going to think about some of the other things people have offered to do for me and consider if it really would be the end of the world if I said "yes" to some of them. My struggle with the ongoing "brain fog" issue is driving me nuts. So I set out to find out what I could about the current state of research and treatment in this aspect of Lupus. What did I find out? Probably far less than if I weren't struggling with brain fog. Not much is actually sinking in or staying with me at the moment - but I've given you links to some of the sites I've read, so if you're thinking more clearly, maybe you can glean more from it all than I did. 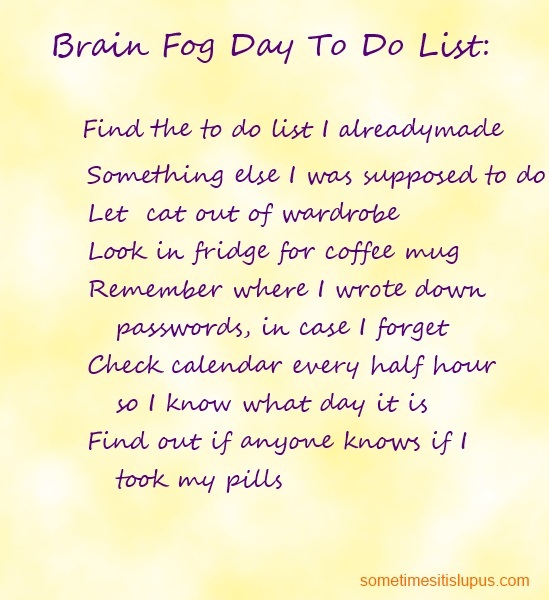 Brain fog, or cognitive dysfunction, includes things like forgetfulness, confusion, struggling to find a word, anything that interferes with normal thought function. The not-so-reassuring things? Well, the researchers don't seem to be learning much. 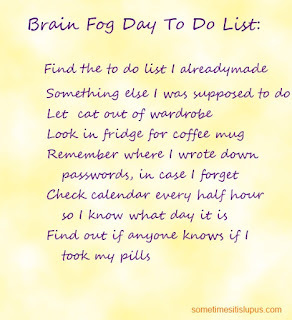 There doesn't seem to be a link between brain fog and how active lupus is, or anything you can see in a blood test (lots of lupus issues don't show up on the blood tests). If lupus has actually caused physical brain damage, that's likely to cause brain fog, but there's no sign of pinning down any other indicators. There's a lot that researchers just don't know. 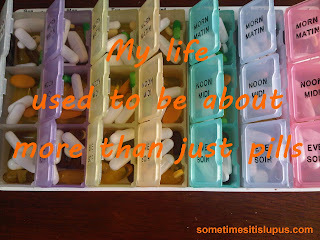 Making lists, using tools like pill sorters, etc may help overcome some of the problems. So do things like repeating the same tasks over and over, and developing habits (always leaving the keys in the same place, etc).